It was a rough season for Greg Carvel in his first year at the helm, as the former St. Lawrence bench boss watched his Minutemen struggle to keep pace in Hockey East and ultimately spend most of the year in the cellar. Now in his second season in charge, Carvel can begin to really make the program his own. He’s done just that, with a very strong recruiting class ranked second in the nation. The Minutemen’s 66 goals on the season (42 in conference play) were far and away dead last in Hockey East, 30 less than next-lowest UConn. Adding to their scoring woes is the loss of the club’s two top scorers in captain Steven Iacobellis (eight goals, 13 assists) and Ray Pigozzi (eight goals, eight assists). Leading the way in the offensive transition will be incoming freshman Jake Gaudet, who amassed 109 points over three seasons in the CCHL and spent the summer at training camp with the Ottawa Senators. The 6-2, 203-pound center will bring the size to an incoming freshman forward class that is more predicated on speed, with Austin Albrecht (10 goals and 37 assists in the USHL last season) and Marco Bozzo (23 goals in the OJHL last year) the most likely to contribute right off the bat. They will join a young returning core, led by the Minutemen’s top returning scorer in junior Austin Plevy (five goals, 10 assists) alongside junior Kurt Keats (five goals, eight assists) and sophomore Griff Jeszka (seven goals, five assists). Graduate transfer student Niko Rufo will also chip in after logging 10 points over four seasons of limited playing time at Providence College. 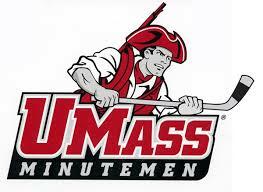 Defensively, UMass lost two big bodies and a lot of minutes in 6-2 Brennan Baxandall (graduation) and 6-3 William Lagesson (signed with the Edmonton Oilers), but Carvel is bringing in some phenomenal recruits in Cale Makar and Mario Ferraro. Makar became the highest draft pick in program history this summer when he was selected fourth overall by the Colorado Avalanche in the 2017 NHL draft. The 5-11, 187-pound defenseman tallied 172 points (44 goals, 128 assists) over 157 career games with the Brooks Bandits of the AJHL, leading the squad to two championships and being named AJHL MVP last season. Ferraro became the second-highest draft pick in UMass history a day later, going 49th overall to the San Jose Sharks. He was named to the USHL First All-Star team and All-Rookie team after finishing the year tied for first among USHL defensemen in goals (eights) and ranking second in points (41) and assists (33). Seniors Dominic Trento and Jake Horton will bring some steady leadership to the blue line, while junior Buffalo Sabres draft pick Ivan Chukarov and sophomore Shane Bear will pitch in. Carvel will hope that his strong incoming freshman class can shore up the inefficiencies his team has in between the pipes. Backup goalie Alex Wakaluk graduated, but incumbent starter Ryan Wischow did not post gaudy numbers in his freshman campaign, finishing as one of the worst statistical goalies in Hockey East with a 3.28 GAA and .897 save percentage. He will need to improve on his numbers, as neither backup Nic Renyard or incoming freshman Brad Arvanitis seem quite ready to push for regular minutes. Bottom Line: Carvel is quickly putting his stamp on this UMass team. The first few years of a new head coach’s regime are frequently filled with turnover, and the Minutemen can once again expect to be near the bottom of Hockey East this year. But if this year’s recruiting class is any indication, Carvel is well on his way to turning the program around and bringing UMass back to respectability.